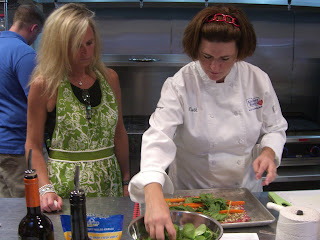 Chef Ruth showing one of our "supper club friends" how to prepare a delicious beef dish. 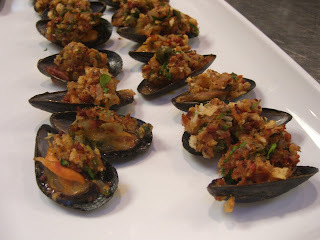 The chorizo-stuffed mussels that "R" and I were in charge of making. I, uhh, chopped stuff--- that's about it. 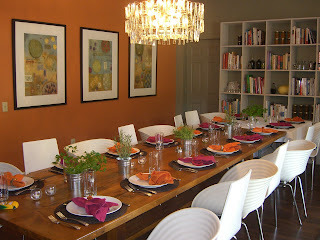 Lastly, a shot of the gorgeous table where we settled in for our meal. It's BYOB, which is a lot of fun. For just $55, it is so worth it. You can also win two passes to an upcoming GK event over at IHeartCleveland.com today! 2. Cooking Classes from The Chubby Cook. Scott and his crew have launched their cooking classes, with several fun concepts that I haven't seen anywhere else. Also, if you register for a January class and use the code ALF2012- then 40% of all proceeds will benefit the American Liver Foundation and Stephanie's Liver Life Challenge goal of running the Disney marathon. 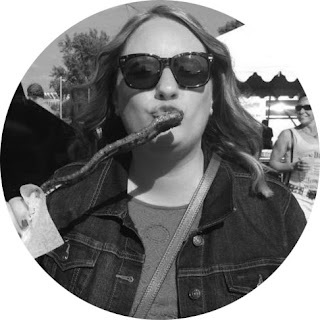 Disclosure- I work for the American Liver Foundation, and manage the LLC program in Cleveland. 3. Gift certificates or The Deck from the Cleveland Independents. Visit their site to purchase certificates for some of our area's best independently-owned restaurants, or buy "The Deck" for that foodie in your life to enjoy all year long. It offers 52 cards with discounts offered on each card for a particular restaurant. You can have fun working your way through the deck for 12 months. Both options can be purchased through "The Shop" section of the website. Well, I hope that this was helpful if you're looking for any last minute gift ideas. Shop local! I hope that this week flies by, because my whole family is coming in from NY and I couldn't be more excited to celebrate with them. Happy Holidays to you and yours.